A picture of a cyclist with a bicycle helmet makes cycling less attractive. This conclusion can be drawn from a big survey carried out among 3,500 respondents from major Danish cities. The survey tested the impact on opinions from pictures representing different "marketing" messages. Seven pictures were used, namely the ones shown as well as a neutral “no picture”, which was used as a reference. The following graph shows how the respondents' view on cycling attractiveness was influenced by the different pictures. This can be regarded as a measurement of the pictures "marketing value" for cycling. 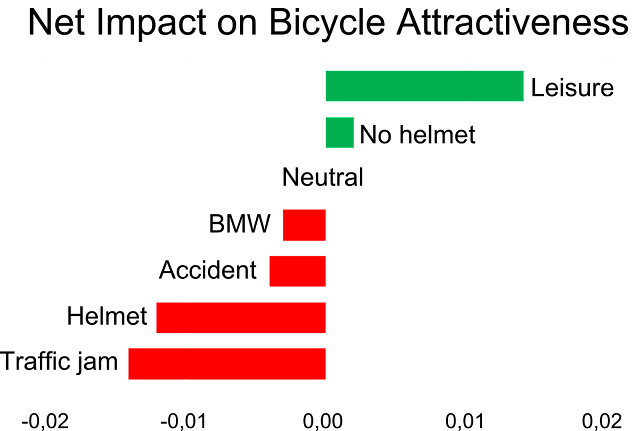 An increase in cycling attractiveness is shown in green, a decrease in red. The impact is the result of viewing the picture in a few minutes. The graph shows that the picture "Leisure" works well as positive marketing for cycling, while the "Traffic jam" and "Helmet" pictures do the opposite. The other pictures have a smaller, not statistically safe impact. Often concern is raised that "scary" campaigns on bicycle safety and car advertising have a negative impact on cycling. The graph shows that this, if any, has only a small negative impact. The picture "Traffic jam", on the other hand, has a strongly negative impact, probably because the repondents don't like the idea of cycling in the middle of all the cars. While this may not be surprising, it is indeed remarkable that the pictures "Helmet" and "No helmet" showing the same person on the same bicycle in the same situation with and without a bicycle helmet have a totally different impact on the attractiveness of cycling. This is even more surprising, as the respondents - when asked on the last page of the questionnaire - associate more positive values with the "Helmet" than the "No helmet" picture. It seems that public campaigns for bicycle helmets have managed to create a positive public opinion on the issue, but that Danes still are reluctant to actually using the helmets. A 28% wearing rate has been reported. Several Danish municipalities are working hard to promote cycling. Quite often City Councils require helmet wearing cyclists to be shown in the promotion materials. The findings of the survey show that this is counterproductive, as it makes cycling appear less attractive for the potential users. "Cycling attractiveness" is, in short, respondents' opinion on cycling experience minus the average opinion of car, bus and train. Respondents scored their experience of the different modes on a scale from "I do not like travelling by ..." to "I enjoy travelling by ....". The survey made use of an indirect questioning technique. Every respondent was presented for one and the same picture as background for several opinion- and behavior questions. The picture itself was only addressed at the last page of the questionnaire. More details on the survey can be found here.